There isn’t such thing as the foolproof formula to perfect creation: don’t let anybody tell you any different. Visual arts, photography included, aren’t really about getting the best equipment; what matters in visual arts is whether the creation is capable to speak to the viewer, either by conveying a strong message or simply by tickling senses and imagination. iPhone photography is not an exception. Of course, many professionals will affirm that it’s impossible to productively use an iPhone to take valuable photographs; to support their reasoning, these professionals will go through long and tedious lists of specs and technicalities. The creatives though will always think differently, as they know every tool has more than what specifications suggest. By exploring and experimenting, creative artists accept disadvantages and flaws in the medium and turn them into unique features. iObsessed is the brainchild of Dan Marcolina, designer and photographer with a passion for iPhone image processing. The iPad Companion counts sixteen chapters. In every chapter, Marcolina analyzes techniques and recipes he has devised to produce peculiar effects to process photos on the iPhone. Commentary and links offer in-depth overview on how the given results can be accomplished; original shots are presented for comparison and all processed photos come with their app formula. By rotating the iPad from horizontal to vertical position, it’s possible to access the app compendium, which contains information on the apps used in each chapter. Extensive video materials (around 90 minutes in all) complete the book, guiding the reader to understanding the workflow from original shot to processed image. 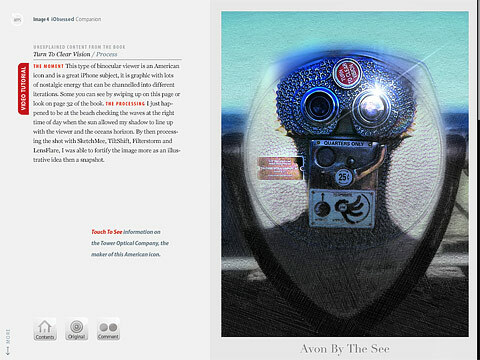 An appendix includes several extras, like links to iPhone camera add-ons, photo gallery, and a brief note on the author. 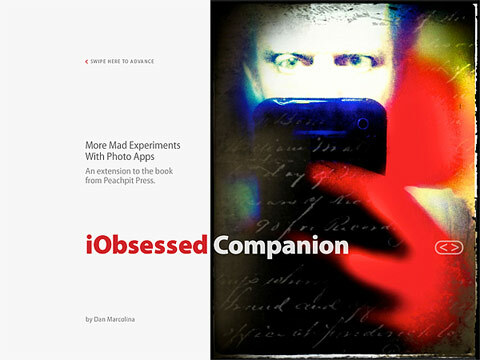 The iPad companion is actually an extension to the iPhone Obsessed book by the same author, published by Peachpit Press, which contains more examples and information on how to use the iPhone creatively. Dan Marcolina’s interactive book doesn’t claim to be the ultimate “how-to” manual to iPhone photography. iObsessed rather presents tips and ideas that uncover the hidden potential of images and go beyond limits inherent to the medium. As such, it can be a great source of inspiration and a reference guide to rewardingly learn to combine possibilities offered by different applications and also, occasionally, by external resources. 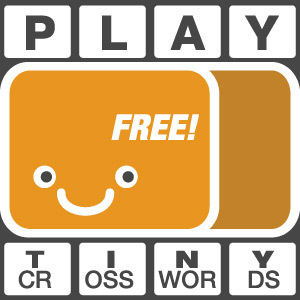 iObsessed is available from the App Store for $4.99/€3.99/£2.99. iObsessed Gets a New Price!